The nineteenth edition of LPM Live Performers Meeting will be from 7 to 10 June 2018 in Rome, at Ex Mattatoio. 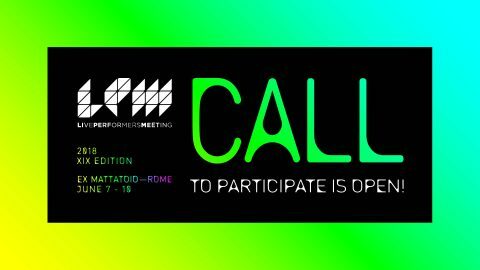 LPM 2018 Rome is now on-line and THE CALL TO PARTICIPATE IS OPEN! Send us your best project or performance and join the most important event on Audio Visuals Performing Arts! The registration form is only available on-line and the subscriptions will be accepted until April 18, 2018.